What's the Most Important Thing About Homeschooling? What is the Most Important Thing About Homeschooling? 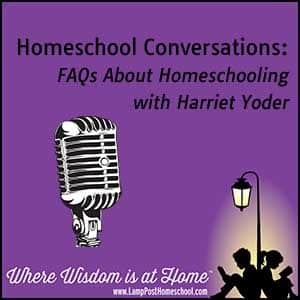 Interviewer Rob Vail of This Side of the Country Radio Ministry and Harriet Yoder chatted about What’s the Most Important Thing About Homeschooling? These mp3 audio files should open automatically. What is the Single Most Important Thing to Remember About Homeschooling? What’s the single most important thing to remember about homeschooling? I think a lot of folks when they start homeschooling go in with the notion that they have to look like public school or have to look like a classroom setting. That really throws the whole apple cart off. We are not anywhere close to looking like public school. The longer we do it, the more we look different because we are on a one-on-one setting. It’s a family setting. Real life comes in. We aren’t on a really strict schedule. Some people are more strict. Usually we do [homeschool] as the day progresses. If we have to stop because someone had a booboo and we need to pray, we stop. If the phone rings because the next door neighbor is sick and they need some soup. We stop and we make soup and take it over to them. We’re different that way. If we go in with the notion that we are there to train this child in the way he should go and to encourage him to use all the gifts that he has for the Lord whatever it may be. It sort of releases us from going in with this preconceived notion of what a [homeschool class] looks like because it doesn’t look anywhere near what a public school classroom setting is. What is Lamp Post’s Mission?